Builders of early American water-works drew on a wide range of European experience, including the writings of the Roman architect Vitruvius and accounts of archeological discoveries of Roman water-works in England and elsewhere. Historical accounts of early London water-works were also known as well as the Parisian water-works projects in the 1780s. 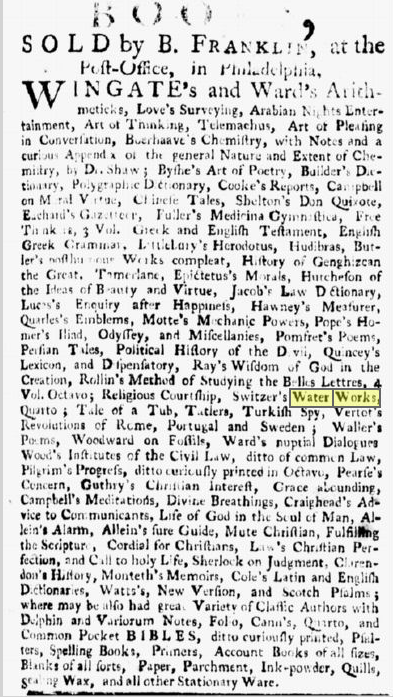 Many other early water-works had existed, but did not become widely known until they appeared in scholarly works in the late 19th and early 20th Centuries, which are included in the general bibliography section. Two American communities had water works built in the 17th Century, Boston in 1649 and Albany in 1678. These were both built by English settlers, who could have drawn on a wide experience from aqueducts in that country, including systems in London, Portsmouth, and Exeter. 1720 San Antonio TX Built by Spanish Missionaries. 1744 Schaefferstown PA Built by William Schaeffer from Germany. 1753 Winchester VA A 1753 deed from Thomas Fairfax to James Wood required Wood and his heirs to provide water conveyed in pipes to the town. 1754 Pittsfield MA Built by local resident Charles Goodrich. 1754 Bethlehem PA Built by Moravian immigrants. 1772 Lancaster PA Built by local resident Casper Singer. 1772 Providence RI Two systems built by corporations. 1773 Nazareth PA Built by Moravians from Bethlehem. 1773 East Greenwich RI System built by corporation. 1774 Dover NH Petition submitted by Cyrus Bangs. 1775 New York City NY Built by Christopher Colles, who immigrated from Ireland in 1771. 1778 Salem NC Another Moravian settlement, influenced by the system in Bethlehem. Immigrants from continental Europe would have had their own history of water works to draw upon, while a body of water works literature in began to appear in the early 18th Century that would have been useful to developers of American water works. 1734 An universal system of water and water-works philosophical and practical. In four books. Faithfully digested, from the most approv'd writers on this subject, by Stephen Switzer. ... In two volumes. This is listed for sale in 1742 by Benjamin Franklin in Philadelphia (see advertisement below). Madrid, October 14. A few Days since died at Toledo, an English Man names Jones, who had been contracted with for conveying Water thro' Pipes of a large Bore, into that City from Springs at a considerable Distance. 'Tis thought he died of Grief, occasioned by the Spaniards breaking their Contract. The Priests give out that he died a good Catholick. He was well known in England by the Name of Gun Jones. 1855 Salem Register, October 29, 1855, Page 1. 'Hobson's Choice.' The old conduit at Cambridge, which will not be superseded by the new one about to be erected in that city, (which we hope it will be elsewhere preserved,) was built in 1614, from funds supplied by the celebrated Thomas Hobson, the carrier, whose stringency in letting his horses for hire, only each one in his proper turn, regardless of the whims or likings of his customers, gave rise to the well known proverb, 'Hobson's choice - that for none.' He appears to have been a wealthy and respected citizen, not content with merely raising the edifice, he left by will the sum of £10 for further beautifying it, with an estate, the annual proceeds of which have been ever since available for its maintenance. Thomas Hobson died on the 1st of January, 1630.- The London Builder. 1899 The Two Books on the Water Supply of the City of Rome of Sextus Julius Frontinus: Water Commissioner of the City of Rome A.D. 97: a Photographic Reproduction of the Sole Original Latin Manuscript, and Its Reprint in Latin; Also a Translation Into English, and Explanatory Chapters, by Sextus Julius Frontinus, with translation and explanatory chapters by Clemens Hershel.